NEW ORLEANS – After brief reprieves from the honor for both teams in 2015, the Adams State men and the Grand Valley State women are back on top as each squad has been named the 2016 NCAA Division II Cross Country Scholar Teams of the Year by the U.S. Track & Field and Cross Country Coaches Association (USTFCCCA). The two Scholar Teams lead a pack of 156 women’s teams and 115 men’s squads from the Division II level that captured All-Academic Team honors. ASU and GVSU earned the Scholar Team honors as the highest-finishing teams at the NCAA Championships to have garnered All-Academic Team honors. Teams must have compiled a cumulative grade point average of at least 3.0 and must have scored at an NCAA Division II regional meet to qualify for All-Academic awards. 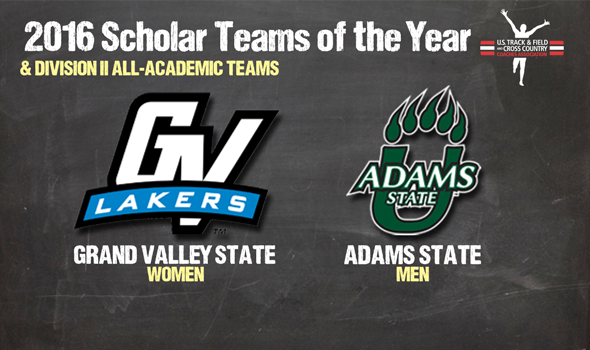 Grand Valley State’s reign of three-straight women’s Scholar Team honors (2012-14) came to a halt last year when Adams State picked up the honor. This year, though, Grand Valley State took home the NCAA Division II Cross Country National Championship, scoring 116 points to Adams State’s 139. Four of the five scorers for the Lakers earned All-Academic Individual honors in Kendra Foley – who claimed the USTFCCCA NCAA Division II Female Scholar Athlete of the Year and the NCAA Division II Individual National Championship – Stacey Metzger, Kelly Haubert and Rachel Bendewald. All told, six Lakers earned All-Academic Individual honors. The Scholar Team honors for the Grand Valley State women’s team mark the fifth time the program has won since the inception of the award in 2006, tying Adams State for the most. Adams State’s men’s team squeaked by Grand Valley State in the final two kilometers of the NCAA Division II Cross Country National Championship, helping the Grizzlies pick up the program’s 12th national title. Kale Adams (17th place) and Chandler Reid (29th place) scored for the Grizzlies while also earning All-Academic Individual honors. A total of 164 institutions earned Scholar Team honors, with 110 of those schools seeing both of their men’s and women’s programs pick up the award. The full lists of the All-Academic Teams can be found below.